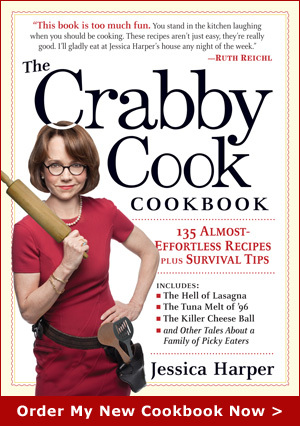 I am way too crabby to attempt such a thing. First of all, I can’t get my head around planning a meal more than 4 hours in advance, let alone three months. And if something takes more than 30 minutes to put together, it ain’t happening in my kitchen. Just the task of cracking all those eggs would be cause for medication. I will be sticking with the more diminutive variety of burger. I made these sliders for a daughter home from college and she flipped. Well, I flipped (without the help of four men), she ate. Rub a large skillet lightly with a little olive oil, and set it over medium heat. (Of course you can also do this on your outdoor grill, lightly oiled and preheated to medium.) When the skillet is hot, add the patties and cook until they are well browned on the bottom, about 3 minutes. Flip the patties over and sprinkle each one with a tablespoon of the grated cheese. Continue cooking until the cheese has melted and the sliders are well browned on the other side, about 3 minutes. This entry was posted on Friday, June 11th, 2010 at 10:30 am	and is filed under Meat Me. You can follow any responses to this entry through the RSS 2.0 feed. You can leave a response, or trackback from your own site. So, the point being… I love slidahs (as we called them when we got them at White Castle in Dayton, OH), but I hope you’ll forgive me if I skip the chipotle mayonnaise for myself. I’m glad you tasted it, though, so I can be sure my condiment-eating friends will have a swell time. I totally hear you Scot…yours is so NOT the weirdest food anti-fetish I have an encountered! Okay now I’m curious – Jessica, what is the weirdest food anti-fetish you have an encountered?